Located at a height of 10,632 feet, Triund is one of the most popular treks in Himachal. It is a magical place. It is a place which can never get old and can never lose its beauty. This place offers jaw-dropping views of Dhauladhar Range at one side and the view of Kangra Valley on the other. 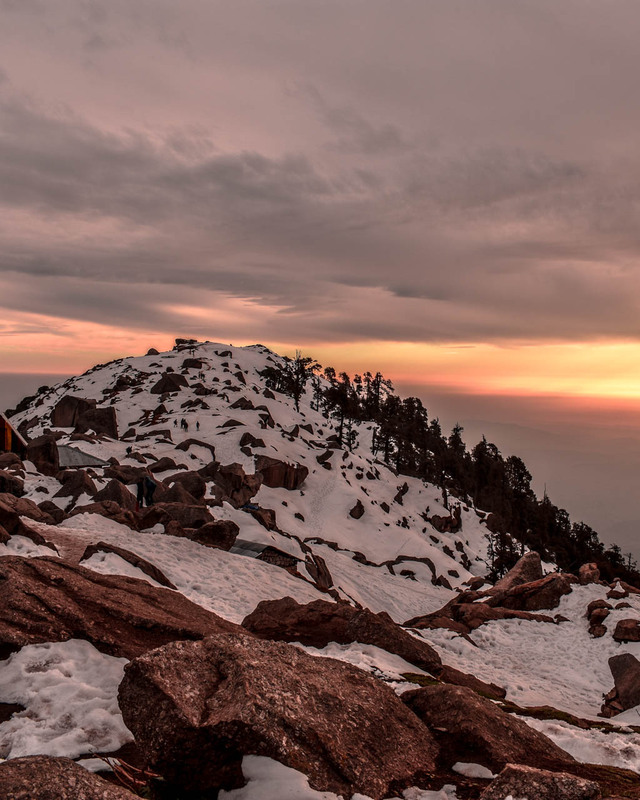 Triund is a hill station that offers stunning views from dusk till dawn and has the ability to leave one speechless with its varied panoramic view and changing colours. But when is the best time to go? Is it during the winters or in summers? Below you will know everything to visit this breath-taking place with a detailed guide starting from Delhi to Triund, Triund trek cost and trek distance. I have been to this place in both the seasons and personally both of them offered jaw-dropping views. In summers the shine of the Sun in the evening is magical, soothing and peaceful. On the other hand, during winters the snow makes everything extremely cold and the hike becomes difficult but due to this the snow sparkles as the sun rays fall on it. So if you ask me, I would say both the seasons have its own charm. Despite the month and the weather, this trek is an evergreen one. Although do avoid it during monsoons as from trek to camp to views, all are spoilt. And the one thing Triund is known for – milky way, is not visible if the sky is cloudy. Thus, both the seasons are perfect to visit Triund. It depends on how harsh the weather is if you want to witness and whether you want to experience snow or not. 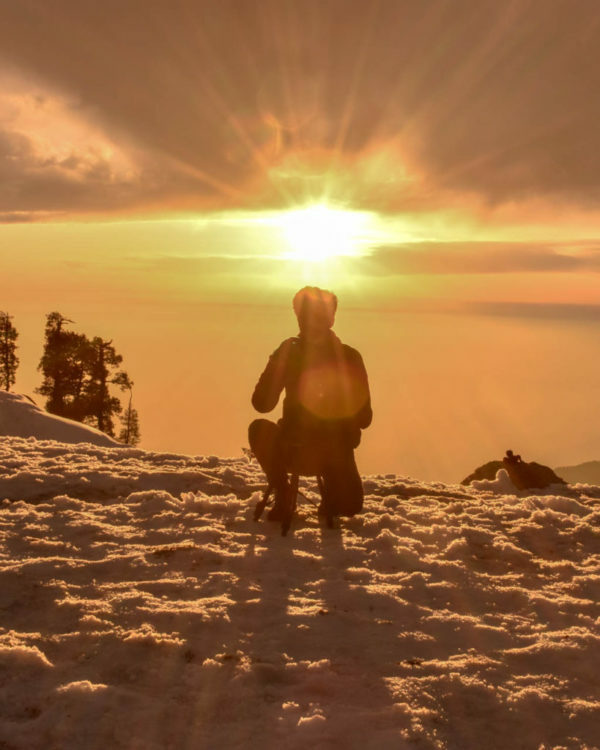 Below, you will find all the details regarding the Triund trek cost, distance, accommodation and a detailed itinerary which can be implied in both the seasons. December Mid to March: Personally I would say the best time is during the winters even though the climate is harsh. This is because the winter glow on the snow due to the warm sun is mesmerizing. April to June: Although the summertime is also a perfect time to go to this place as the view of the milky way is really amazing and clear. July to September: Do avoid Triund during the monsoon time as the sky is covered in clouds making the night sky faintly visible. Also, while camping if by chance it starts to rain the stay will become difficult. Also, treks on a wet mass of land are also difficult. If you want some respite from the crowds, it’s better to plan your trek during weekdays. There are overnight buses from Delhi to Mcleodganj that takes about 10 hours to reach Mcleodganj. If you are not able to find direct buses to Mcleodganj from Delhi, I would advise you to take a bus to Dharamshala and from here you can take another bus/cab to Mcleodganj. The distance between Dharamshala and Mcleodganj is just half an hour. The HRTC buses are available from ISBT Kashmiri Gate. Since Mcleodganj and Dharamshala are touristy areas, it is better to book the bus in advance since the seats get booked fast. The nearest airport to Triund is Kangra Airport or Gaggal Airport. From the airport, you can take a direct bus or book a taxi to reach McLeodganj or Dharamshala. 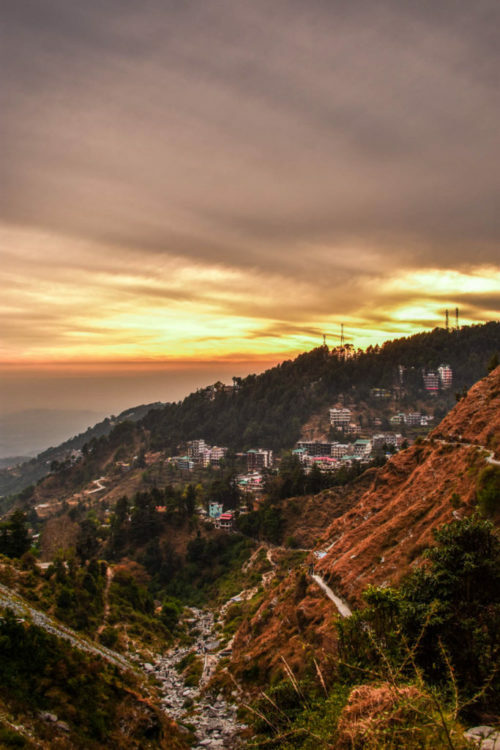 You will reach Mcleodganj early in the morning. From here on, you would have two options. Either to stay in a hotel or a hostel or book a room for three hours to freshen up and go straight to trek for Triund. It depends on how much time you have. Mcleodganj is beautiful and one can spend a day exploring this town. 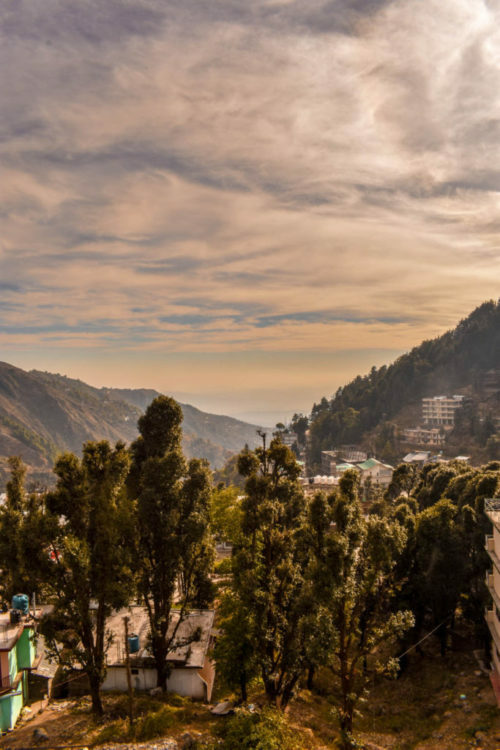 If you want to check out more options in Mcleodganj, you can make the booking through the below link. The best part is that you can reserve a room for your stay with no advanced payments required. From the hostel, you can reach the Bhagsu waterfall within 20 minutes of hiking. There is also a Shiva café which is 10 minutes away from the waterfall offering a stunning view of the sunset. We had tea and Maggie here while watching the sunset. You can later explore the market as well while coming back from the Shiva café that comes on the way. After having breakfast start for the trek. There are two ways that you can follow. Either take a shared taxi directly to the start point of the Triund trek or start the trek from Mcleodganj itself. The trek to Triund is about 8 KMs and takes 3-4 hours depending on your speed. It is a moderately difficult trek and you also need to sign on a register before commencing for the trek. It is just a track record kept by the authorities as to how many people have gone on the trek. (I have covered the details of the trekking route below, along with checkpoints and pictures). Reach here by afternoon, and soak in the surroundings. It is really one of the most beautiful views to see. As soon as you reach the place it is better to find a camp. The sooner you reach the better camp you can get at your preferred location. You can also book the camp in Mcleodganj itself. During the peak season, it will be advantageous to book the camp beforehand because booking the camp on the spot gets difficult otherwise. Carry your own food items to the trek. You will not get many options at the top. Mostly, you will get fried rice, Maggie and tea in the camps itself. Also, if you are carrying your own food, do ensure that you take back the waste materials along with you. Please keep the environment clean. But, honey, how would you learn to live with the folks, if you still don't know how to live with yourself. Start the descend early in the morning the next day. There is a bus that leaves for Delhi in the afternoon. If in case you are not able to catch the Delhi bus, the other option would be to catch a bus that leaves for Chandigarh from Dehradun. From Chandigarh, there are frequent buses that leave for Delhi. In Mcleodganj we stayed in a hostel as it is economical. HosteLavie is a good place to stay in. It is budget friendly and offers good views. They also provide you with breakfast in the said amount. Furthermore, dorms and washroom are clean as well. If you want to spend a night in Triund then you would have to either rent a camp or pitch your own tent. You can book the camps in Mcleodganj itself and I strongly recommend booking it during the peak season. Otherwise, you can also book the camp once you reach the top. Try reaching as early as possible so that you have the leisure of booking the camps that are at the best spot. You can either start the trek from Mceleodganj or take a cab or taxi till Gallu Devi Temple from where you can start the trek. Below, I am mentioning a few checkpoints that will guide you to the trek a little better. In Mcleodganj Main Square there is a steep and upward walk that passes through the office of Regional Mountaineering Centre. You will find this in the three-way intersection of the road. From here, you will reach a water tank and nearby there is also a government school of Dharamkot. You can also hire a cab or a shared taxi until this point. If Mcleodganj is your start point of the trek, the total distance to reach Triund point would be 9 KMs and about 4 to 5 hours. From the government school, take a route from the forest, which will take about one hour to reach to Gallu Devi Temple. You can also take a hired taxi from here or a shared cab as well which will make you reach the Gallu Devi Temple through the road itself. You can rest here for a while and eat something. From here there is a trekking path going northeast that leads to Triund hill. From here on the pathway is easy. There is a clearly defined route to the Triund Hill. One can just not get lost the path is that defined. On the way, two cafes come. One is Magic View Cafė and another one is Best View Cafė. Further, at the base of Triund Hill, there are several tea stalls, where you can rest and enjoy the tea. The trek to Triund is neither difficult nor easy. It is a moderate one with clearly defined pathways. However, one clearly needs a little stamina especially if you do not have prior trekking experience. It takes about 3-4 hours to reach to the top with an average walking speed. One does not need a guide to this place as the trails are properly defined with 100% visibility. There is no chance of you getting lost. Plus, a lot of tourists go on this trek. Below, I am embedding a mao that will help you in tracking the distance a little better. The bus cost varies from INR 700/- to INR 1,300/-. You can either take an ordinary bus or Volvo depending on the budget and comfort you want. From Mcleodganj everything becomes simple. The buses are really cheap and you can get a shared taxi as well to several places for just INR 15/-. The stay in HosteLavie costs less than INR 400/- per day that also includes breakfast. You can book the hostel here – link. Prices of a camp range around INR 500 for a single occupancy tent to INR 1,000 for a double occupancy setup. Getting food in Mcleodganj is really easy and cheap. 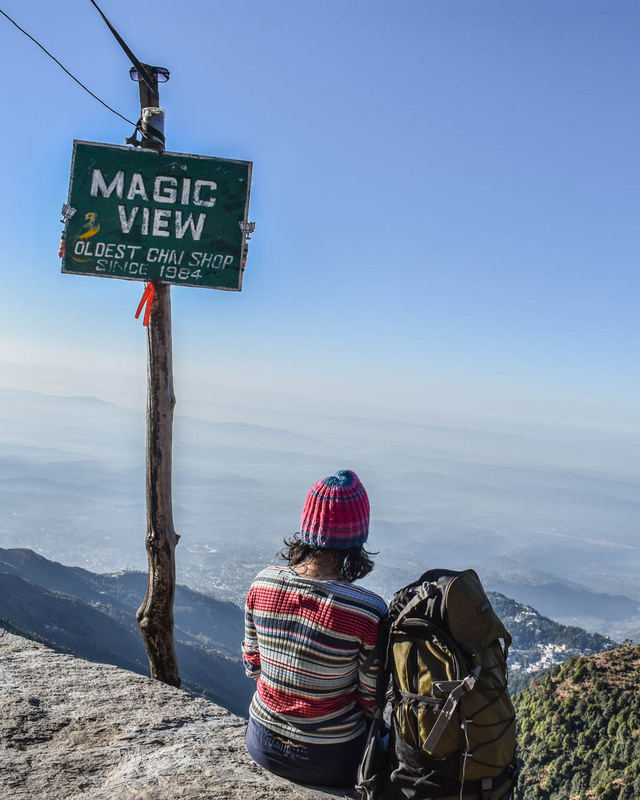 You will easily be able to eat out a meal for INR 150/-, however, the price of tea and Maggie doubles on the Triund trek and cafes. Once you will reach the campsite, you will need a day pack to carry your essential small things around the camp while exploring. Warm Clothes – The temperature falls drastically on the Triund hill. While trekking you might feel hot, however, during the night it gets really cold and chilly and it is always better to carry socks, jacket, gloves and mufflers with you. You can wear woollen gloves however, during snow season buy something similar to the link below as the snow can get trapped in the woollen gloves. Good Hiking Shoes – Triund is a good place to hike or trek if you want to say. The path is a little rocky and sandy. It is always better to have good hiking shoes that have a good grip at the bottom. During winters, it becomes all the more necessary to wear good shoes, especially the ones that can sustain in snow would be better so that they remain waterproof. Water Bottle – Triund does not have the facility to provide water. Even if the cafes have water bottle left the cost gets double. During peak season these water bottles also run out of stock so it is better to carry one from Mcleodganj itself. Food – Getting food on Triund hill sometimes get difficult. The cost also doubles. Of course, one can enjoy Maggie and fried rice along with tea in cold, however, do carry some snacks along with you just in case. Raincoat/Poncho – If you are planning to trek during the monsoons, or during the winters, it is better to carry a raincoat along, or a poncho. For DSLRs, carrying extra batteries is a must since on the top there are no sockets to charge them. For your phones and for your GoPro, having a power bank is essential. In high altitudes, the rays of the sun get severe. Having a good pair of sunglasses is a must. There is minimal connectivity in Triund. You will get proper network connection till Mcleodganj only. However, you can get some network near Triund Mountain Lodge which is situated on the Triund hill. Who needs a connection in Triund though, in a place with timeless beauty? If you plan to visit Triund during the winters or summers, does not really matter. The place looks beautiful anyway. It is about preference and how much harsh of weather you would be able to survive. Hope this guide helps you in planning your Triund trip a little better! Do comment in case of any questions or further suggestions to this guide!